Our tanks and rental equipment are up to the same high standards than our facilities. We don’t like rusty, banged-up tanks and gear that’s falling apart, so we use nothing but the best. We even have our own compressor to insure the safety of each and every tank. Our gear rental comes from Cressi and ScubaPro and is completely replaced each November with entirely new gear. Our diving center has brand new complete sets of rental equipment that will make your diving experience safe, and enjoyable. We also offer computers and torches for rent. We have our rental gear routinely inspected and serviced. 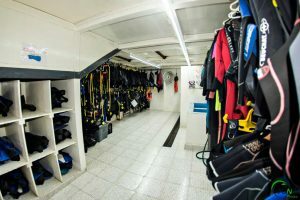 Proper maintenance is done by our in-house fully qualified and highly trained technicians to guarantee a comfortable and safe diving experience. We carry a wide selection of snorkeling and diving equipment for sale, from masks, snorkels, fins, wet suits to underwater cameras, computers, spearguns, and accessories for the gadget-lovers. You can find in our dive shop the best brands on the market: Aqualung, Atomics Aquatics, Camaro, Cressi, Dive Rite, GoPro, Mares, Poseidon, Scuba Pro, Scuba Supreme, Suunto, Trident, Tusa and many more. You can virtually find everything that you need as a passionate diver or snorkeler during your vacation in Mexico, as well as nice souvenirs such as Mexico Blue Dream T-Shirts for those you left at home.